The QRectF class defines a rectangle in the plane using floating point precision. A rectangle is normally expressed as an upper-left corner and a size. 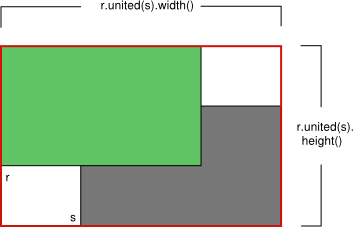 The size (width and height) of a QRectF is always equivalent to the mathematical rectangle that forms the basis for its rendering. A QRectF can be constructed with a set of left, top, width and height integers, or from a QPoint and a QSize. The following code creates two identical rectangles. There is also a third constructor creating a QRectF from a QRect, and a corresponding toRect() function that returns a QRect object based on the values of this rectangle (note that the coordinates in the returned rectangle are rounded to the nearest integer). The QRectF class provides a collection of functions that return the various rectangle coordinates, and enable manipulation of these. QRectF also provide functions to move the rectangle relative to the various coordinates. In addition there is a moveTo() function that moves the rectangle, leaving its top left corner at the given coordinates. Alternatively, the translate() function moves the rectangle the given offset relative to the current position, and the translated() function returns a translated copy of this rectangle. The isEmpty() function returns true if the rectangle's width or height is less than, or equal to, 0. Note that an empty rectangle is not valid: The isValid() function returns true if both width and height is larger than 0. A null rectangle (isNull() == true) on the other hand, has both width and height set to 0. Note that due to the way QRect and QRectF are defined, an empty QRectF is defined in essentially the same way as QRect. Finally, QRectF objects can be streamed as well as compared. When using an anti-aliased painter, the boundary line of a QRectF will be rendered symmetrically on both sides of the mathematical rectangle's boundary line. But when using an aliased painter (the default) other rules apply. Then, when rendering with a one pixel wide pen the QRectF's boundary line will be rendered to the right and below the mathematical rectangle's boundary line. The QRectF class provides a collection of functions that return the various rectangle coordinates, and enable manipulation of these. QRectF also provide functions to move the rectangle relative to the various coordinates. For example: the bottom(), setBottom() and moveBottom() functions: bottom() returns the y-coordinate of the rectangle's bottom edge, setBottom() sets the bottom edge of the rectangle to the given y coordinate (it may change the height, but will never change the rectangle's top edge) and moveBottom() moves the entire rectangle vertically, leaving the rectangle's bottom edge at the given y coordinate and its size unchanged. In addition, QRectF provides the getCoords() function which extracts the position of the rectangle's top-left and bottom-right corner, and the getRect() function which extracts the rectangle's top-left corner, width and height. 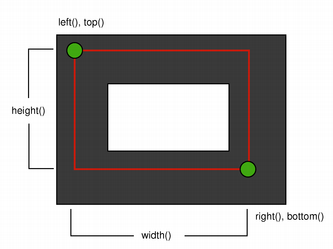 Use the setCoords() and setRect() function to manipulate the rectangle's coordinates and dimensions in one go. See also QRect and QRegion. Constructs a QRectF rectangle from the given QRect rectangle. Returns the position of the rectangle's bottom-left corner. Returns true if the given point is inside or on the edge of the rectangle; otherwise returns false. Returns true if the point (x, y) is inside or on the edge of the rectangle; otherwise returns false. Returns true if the given rectangle is inside this rectangle; otherwise returns false. Returns true if this rectangle intersects with the given rectangle (i.e. there is a non-empty area of overlap between them), otherwise returns false. 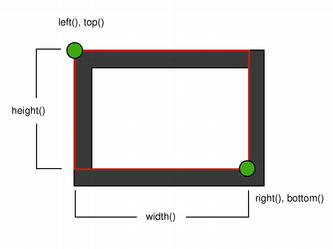 An empty rectangle has width() <= 0 or height() <= 0. An empty rectangle is not valid (i.e., isEmpty() == !isValid()). A null rectangle has both the width and the height set to 0. A null rectangle is also empty, and hence not valid. 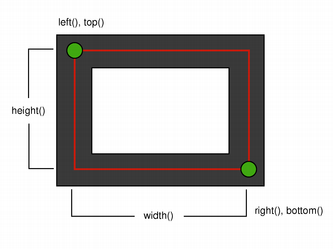 A valid rectangle has a width() > 0 and height() > 0. Note that non-trivial operations like intersections are not defined for invalid rectangles. 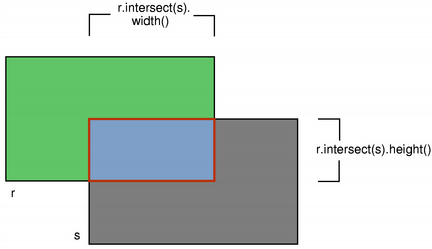 A valid rectangle is not empty (i.e., isValid() == !isEmpty()). 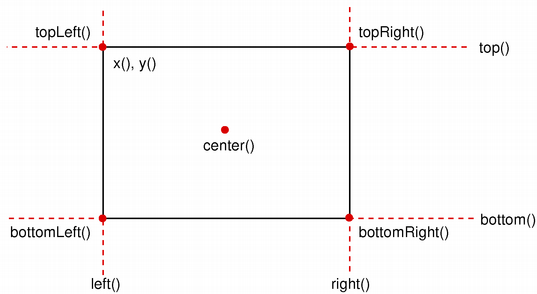 See also setBottomRight(), moveBottom(), and moveRight(). Moves the rectangle vertically, leaving the rectangle's top line at the given y coordinate. 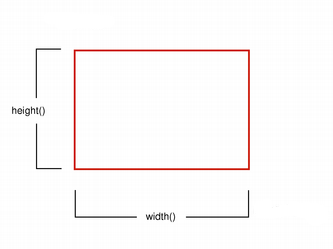 The rectangle's size is unchanged. See also getCoords() and setRect(). See also getRect() and setCoords(). Returns a QRect based on the values of this rectangle that is the smallest possible integer rectangle that completely contains this rectangle. Returns a QRect based on the values of this rectangle. Note that the coordinates in the returned rectangle are rounded to the nearest integer. See also QRectF() and toAlignedRect(). Moves the rectangle dx along the x-axis and dy along the y-axis, relative to the current position. Positive values move the rectangle to the right and downwards. See also intersected() and operator|=(). See also united() and operator|=(). Writes the rectangle to the stream, and returns a reference to the stream. Reads a rectangle from the stream, and returns a reference to the stream.